Aqua (water), Persea gratissima (avocado) oil, cetearyl olivate, sorbitan olivate, Olea europea (olive) seed oil, hydrogenated vegetable oil, propanediol, acetyl hexapeptide - 3, Leptospermum mel (manuka honey) extract, glycerin, Cyathea cumingii (mamaku black fern) leaf extract, betaine, stearic acid, butylene glycol, arbutin, citric acid, sodium sulfite, acetyl tyrosine, Saxifaga sarmentosa (strawberry begonia) extract, Paeonia suffruticosa (peony) extract, aminopropyl ascorbyl phosphate, Scutellaria baicalensis (skullcap) root extract, glutathione, lactoperoxidase & glucose oxidase, isoamyl laurate, galactoarabinan, carrageenan gum, tapioca starch, Salvia hispanica (chia) seed oil, Actinida chinensis (kiwifruit) seed oil, sodium phytate, alcohol, bisabolol, sodium citrate, hyaluronic acid (plant derived), Helianthus annuus (sunflower) seed oil, Rosmarinus officinalis (rosemary) leaf extract, Vitis vinifera (Vinanza® Grape) seed extract, Vitis vinifera (grape) seed extract & Actinidia deliciosa (kiwifruit) extract (Vinanza® Performance Plus), apitoxin (bee venom) powder, fragrance of honey: benzyl alcohol+, benzyl benzoate+, benzyl cinnamate+, cinnamyl alcohol+, coumarin+, farnesol+, geraniol+, isoeugenol+, d-Limonene+, linalool+. + Component of essential oil. Apply generously to your face, neck and décolletage at the day’s dawn and dusk. 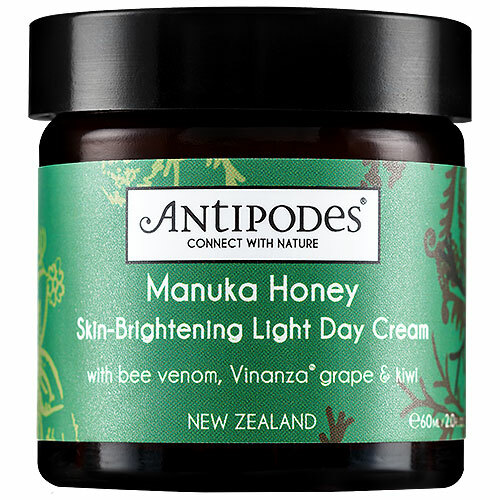 Below are reviews of Antipodes Manuka Honey Light Day Cream - 60ml - Best before date is 30th June 2019 by bodykind customers. If you have tried this product we'd love to hear what you think so please leave a review. Restore a light and fresh visage with this bioactive day cream. 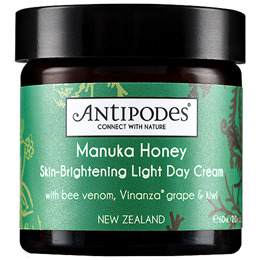 Bee venom and mamaku black fern provide a gentle lifting effect.